Recently, I was contacted by the lovely Stephanie from Prairie Charms, to take part in 'Project Blogger'. Project Blogger gives beauty and fashion bloggers 50% off the Prairie Charms bracelet collection from July- August plus the chance to design a unique semi-precious bracelet for Prairie Charms. For those of you who haven't heard about Prairie Charms, here's a little insight, taken from their 'About' page: "Prairie (Charms) prides itself in sourcing its gems and charms worldwide and aims to provide you with an eclectic mix of the finest, eye-catching gemstones available each with their own 'charming' (get it?) differences derived from natures' own eye." Prairie Charms sell friendship wraps, bracelets, rings, hair slides, and much, much more. Their prices range from £1 for friendship wraps to £16 for bracelet sets. Their slogan is that 'you can never have too many accessories'. Finding new pieces of jewellery, is a favourite pastime of mine, and I'm always on the look out for new quirky and interesting pieces. As 10% of proceeds go to the Great Ormond St. Hospital Charity's 'Kiss It Better' campaign, you can skip the bus ride to 'Guiltville' and indulge to your hearts content, knowing you are doing your bit for charity. Finally, a guilty pleasure, we can indulge in guiltlessly. Guilty pleasure minus the guilt equals...Now, I may not be great at Maths, but even I can work out that equals pleasure. Another thing I love about Prairie Charms is the fact that their collections are limited edition, which means you can be sure that you won't see the whole world and her mother, wearing your special bracelet of choice. 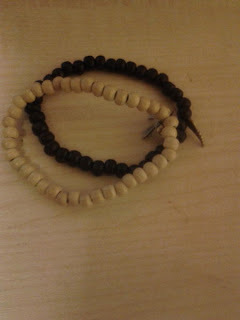 One of the things that I love about the bracelets are their names. All the bracelets are named after sayings and quotes, some of them well known, others I've never heard of. The one I ended up ordering was called: 'All imaginable futures are not equally possible' which is a bracelet set that consists of two bracelets, one of which is cream and has a gold bow charm, the other one being black and sporting a gold feather charm. 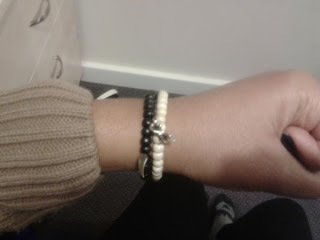 The bracelets are very versatile, as you can wear them by themselves, or team them up with other bracelets, if you like layering your bracelets like me. Some of them are a bit small, which I'm not a fan of, but this is down to personal preference, and not a major issue. One con of the bracelets, was that the beads on the bracelets were considerably smaller in real life, than they appear to be on the website. I do feel there needs to be a notice alongside their pictures saying something along the lines of 'Pictures not to scale'. The postage and packaging is a bit dear, as it's £2.99 for Second Class Delivery and £3.49 for First Class. The customer service however is brilliant. Stephanie is always on hand to respond to your messages, and replies to your tweets/ DM's if not instantly, then as soon as she can. I had a few hiccups with my ordering process, as my package from the Royal Mail went missing; (I think my postie, likes my deliveries as much as I do, ha ha! ), and Stephanie issued me a new package free of charge, which was very kind. If you wanna find out more about Prairie Charms then have a browse of their website here or send Stephanie a tweet @Prairie_Charms. If you are interested in buying from the website, don't forget to enter 'Charmed35' for a 35% discount off your purchases/ 'FREESHIP' for free postage and packaging. lovely post! your blog is amazing!